His own chemistry was his worst enemy, and it took John Falk from the wilds of Garden City to sniper-infested Sarajevo during one of the most savage conflicts in recent memory. But through it all, he kept reaching out for the life, love, and friendship that his illness had made impossible. 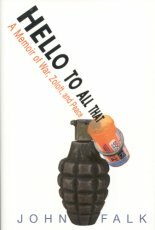 Hello to All That is his story--the crazed, comic, and hopeful tale of a guy who never surrendered. Falk was an average Long Island kid, until depression trapped him, at age twelve, in a lonely world. Ashamed and afraid, he said nothing and tried to keep going with tips from his big, loud, loyal family. By twenty-four, he was all alone, living in his parents' attic, surviving on the books by war correspondents that provided his only escape from the emptiness he felt. When he found a blue pill called Zoloft, he thought his struggle was over. But it took a journey to Sarajevo--where he set out to make his name as a reporter--to show him how far he still had to go. John Falk's journey has never been predictable. Neither is his moving, outrageous, and sometimes suspenseful memoir. Here is the tale of a real man's fight to defeat his greatest enemy, connect, cure himself, and finally, finally live.